So, something a little funny happened today. And as happens so often, it tied into the Polish Boy Scouts. Well, sort of. I’m kind of getting ahead of myself. So, I just posted, “THE NAZIS WERE NOT SOCIALISTS.” And I left it at that because 1) Errant nonsense, particularly in the form of a shared picture, is not worth dealing with; 2) I didn’t let it go unchallenged; and 3) likening Bernie Sanders to Nazis is even more nonsensical. Thought-provoking, no? I had not run across it in all twenty-two books I’ve read and who knows how many online sources, original documents, movies, research I’ve done for the Polish Scouts. So I took a look and discovered that at best this is propaganda; it defined the Nazi “brand” with a whole lot of promises that were never carried out. And I posted some of that–but I was supposed to be reading on Canaris today so I jumped back into that. A little while later, friend who posted the original meme said, “It’s right there in the name,” illustrating either a profound desire to annoy me, or a profound misunderstanding of what words are. I mean, they made everybody call Kim Jung Il “Dear Leader.” It didn’t mean he was actually dear or even necessarily the leader. And then the second friend replied, explaining to me that the designations “communist” and “socialist” were perhaps meaningless in the discussion at hand and listed some specific economic examples of how Nazism was socialist. I’m not strong on economics (though words and how they change through time? I’m pretty good on that), and the focus of the research has been social history and personal narrative and ideological background. And, whether or not it was true, I wanted to really know it for myself. It’s a pretty significant hole, not just in the research, but in the meaning of the Third Reich and ultimately the meaning of the Warsaw Uprising, child soldiers, and all those themes I’m dealing with. So, here’s the TL/DR response: No. Nazis were not socialists. Socialists are not Nazis. And here’s the researched, well-considered, thoughtful response I wrote that was so long I thought, “That would make a great blog post!” Or possibly, a doctoral dissertation. “I considered just searching this question on-line, but that’s not really what I want to do. I don’t believe in pre-fab research; I wanted to consider the question on its merits and on my own. So if I’m quoting someone, I don’t mean to be. “I’m hung up on the idea that a totalitarian state could ever be a socialist one. Going back to Enlightenment principles, government depends on the consent of the governed. 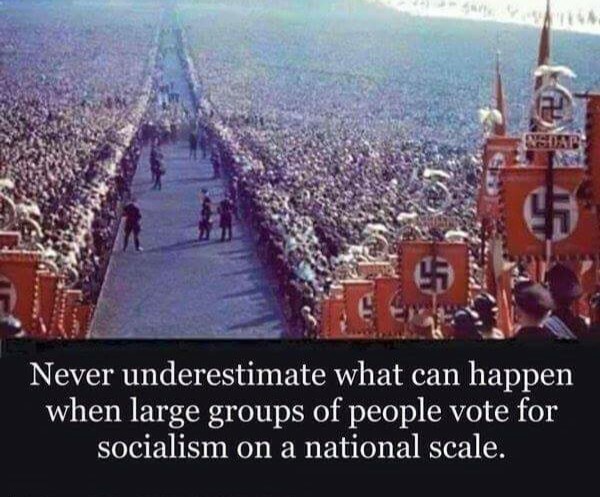 In a totalitarian state like the Third Reich, it depended on the consent of the 32% of the people who voted for Hitler in the second (and last) free elections held by Weimar Germany. A coalition government was formed and Hitler seized power. There were numerous attempts to unseat him; one of these was on the eve of the Sudetenland crisis, but the generals were betrayed by Chamberlin. In any case, socialism is more than just government ownership of the means of production, resources, etc. ; at its core it requires a democratic or collective ownership. In a totalitarian state, by definition that can’t be the case; the ownership is driven by the person or group at the top, not by the people as a cooperating entity. “Leaving the ideology aside (which is difficult when discussing Nazis), we could go on to who the Nazis considered their enemies to be. The SA (Brown Shirts), the paramilitary wing of the Nazi party, used to go out and disrupt meetings of Communists and Social Democrats. The SA was well known for street fights with Communists. Hitler had dismantled all the other political parties by 1934, partly by putting their leaders into Dachau, which left the SA at loose ends and causing fights with passers-by and sometimes with foreign diplomats. The SA was also the left wing of the party; its ranks had been swelled by the unemployed, who were eager for Hitler to begin breaking up the estates of German aristocrats and take other radical economic action. This didn’t happen in 1933 or 1934, but army criticism of the SA as a “rabble” did. Hitler needed the army; more, he needed the support of non-Nazis in the army, so during the Night of the Long Knives he purged the Nazi party of its left wing. By murdering it. Hitler also used the opportunity to get rid of conservatives he thought were unreliable. As a result, most of Chancellor von Papen’s immediate circle were murdered. Some old enemies, such as the former Nazi Gregor Strasser, were killed as well; so were the former leaders of the Catholic Centre Party, which had been aligned with the Social Democrats. And make no mistake: Germany’s Social Democrats were (and are) socialists. “The concentration camp system was built in the first place to house political prisoners. The political prisoners in the camps were identified as Social Democrats, Communists, and others who opposed Nazism, such as Jehovah’s Witnesses. So rather than making common cause with the established Socialists or Communists, the Hitler regime regarded them as enemies and arrested them in large numbers. “We could also look at who the Nazis counted as their friends. Noted American conservatives Henry Ford, Charles Lindbergh, Himmler’s pen pal J. Edgar Hoover, Gerald L.K. Smith, and Pierre DuPont. None of these people would have remotely considered themselves to be Socialists, or anything other than firm conservatives, political, social, and economic. “Admittedly going out on a limb here, but the foundation of National Socialism is that people can’t ever improve or change who they are. Political prisoners were kept alive and served limited sentences in the camps because they were considered genetically valuable. Good German women were supposed to have baby after baby because it was good for the race. Eventually, every road to every social program, every military campaign, every educational program, led back to the idea of and the development of the Master Race. Nazi eugenics owes an embarrassing debt to American eugenics. Nazi racism had roots in colonialism and the idea of the White Man’s Burden. The Klan, the eugenicists, all of them thought that Jews had brought communism and socialism and trade unions into the world. “Meanwhile, Nazism was in direct conflict with several other philosophies, most notably (for me) scouting. The scouting movement was all about improving the self through education. Although in many countries scouts were segregated, Baden-Powell himself thought this was an error. Scouting was really the antithesis of Nazism; it emphasized betterment of the existing people, not removing them from the gene pool. “So, finally, economics. Which you know I’m weak in, but I will do my best. Nationalizing the banks: The banks had been taken over by the Weimar government and Hitler’s government re-privatized the four major commercial banks in Germany between 1934 and 1938. The banks did, however, have to provide government financing, so it could be argued that they were under government control. It turns out that the Nazis privatized a lot of formerly public companies. Source: http://www.jstor.org/stable/27771569?seq=1#page_scan_tab_contents Massive public works: This is true, but again, it was a continuation of Weimar policies; just like in America, it was planned that these projects would help reduce unemployment and it worked (but not as well as war was going to). In Germany the projects were funded by deficit spending, and eventually through stolen assets. Capture of major manufacturers: I’m not honestly sure what this means. IG Farben, Ford, IBM, and countless others had government contracts; they were paid for producing particular goods and services (such as IBM’s punch cards being used to track concentration camp prisoners). The German railways were privatized under the Nazis, as were various other companies. So really, it was Weimar that was socialist. Meanwhile, when Jews left Poland and Germany and other places, their businesses were taken over by individuals–not by the state. And for the most part German-owned businesses were left unmolested. “Later, it’s true, some companies were taken over by the government. As far as I can tell, this was done so that Goering and others could enrich themselves through public money to be filtered through their companies; they did not actually run the factories. I can’t find the reference, but I know I read about one such business that was taken over because the owner was not sufficiently Nazi friendly. And again, I think these business takeovers were an outgrowth of totalitarianism rather than a socialist ideology. Hitler himself was uninterested in economics in general and socialism in particular: “What need have we to socialize banks and factories? We socialize human beings.” By which he meant that the state didn’t have to own the banks and businesses if it already owned the people. “And, eventually, that’s the POINT. Hitler didn’t care about any doctrine other than the one he made himself. He took some ideas and rejected others, and whatever lip service he paid, in his actions he always rejected socialism. And, wherever his grave is, he’s probably spinning in it at being compared to Bernie Sanders! His was a government in which he told his people his goals, and then sat back to see how they could make them happen. Anyway, the moral of the little story: yes, I have days when I’m tired of fighting the good fight. I get exhausted by people. There are reasons to oppose Bernie Sanders; you don’t have to make up your own facts. I get tired of making the same arguments over and over; I get demoralized by people who’d rather believe lies than the truth. I get tired of people who won’t open their minds to any idea that Rush Limbaugh didn’t tell them first. And then some days, good sparks come from hitting opposing ideas off each other. I might never have looked into the economics of Nazi Germany as a policy without those posts. Because what America is really about is the free exchange of ideas, even (and especially) with people you disagree with.